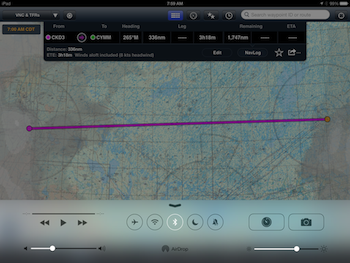 We are happy to report that overall, we have seen good performance with ForeFlight Mobile on iOS 7. We have put a lot of effort into making sure ForeFlight Mobile runs well on the new iOS. With an OS release this big, it is inevitable that there will be things that both Apple and app makers will have to work through. So far there have been no major issues with ForeFlight Mobile and we are quickly addressing anything that needs attention. Although many of you have already updated to iOS 7, if your iPad is a critical part of your flight deck, waiting for Apple to push a couple of minor bug-fix updates is prudent. Additionally, we strongly recommend waiting to fly with the new iOS until you have a chance to familiarize yourself with the significant changes–like the overhauled user interface and aesthetics, app switching, radio management, and force quit app functions–and make sure all apps operate as you expect. We’d like to share with you what we feel are the important highlights of the new iOS. If you have decided to update to the new iOS, we highly recommend that you backup your device to either iCloud or iTunes before you upgrade. It’s easy to do and cheap insurance in case something goes wrong. This article on the Apple website will guide you through the process. Once you’ve completed the backup, go to Settings > General > Software Update on your device and begin the download. If you’re still unsure about updating, you can be confident that ForeFlight Mobile continues to run great on iOS versions back to 5.1. Even if you don’t update iOS, we do encourage you to update ForeFlight Mobile to the current version released last week—ForeFlight Mobile 5.4—to ensure you have the latest features and fixes. Sometimes an app can stop responding correctly. If this happens, a force quit of the app can often resolve the issue. iOS 7 introduces a new way to completely close down (or force quit) the app. Double-press the home button below the screen and swipe up on the app thumbnail that you want to force quit. Press the home button again to return to the main screen and relaunch the app. We’ve found the new “control center” to be a huge improvement. Incorporate its single up-swipe into your pre-flight checklist to quickly disable the cellular radio, adjust brightness for better battery life, or enable Bluetooth for ForeFlight audio alerts. We recommend turning this feature off. It can shorten battery life and introduce the risk that your aviation apps are updated right before a flight without your knowledge. Before updating to the latest version of ForeFlight Mobile and flying with it, we recommend familiarizing yourself with the new features and downloading any new required data. Add a step to your pre-flight checklist to turn off WiFi and Cellular data, then check that you have all the data you will need for your flight on your iPad. To turn off this automatic download setting, go to the main Settings app, then tap iTunes & App Store, then set Automatic Downloads of Apps to Off.